Der Gerät – the original! Doner is expected to be the Germans’ most popular Turkish fast food. It is healthy, filling and available on nearly every corner. No matter whether the doner consists of mutton, veal or turkey, our doner robot quickly, easily and hygienically cuts any type of doner meat. Long gone are the days when the doner had to be cut manually! Just one simple push of the button and der Gerät provides you with ready cut meat. Intelligent sensors optically integrated into the doner robot ensure user-friendly operation. Thus, any thickness desired can be cut for a portion of doner meat. Make your customers happy! Thanks to this doner robot, long waiting times in front of the counter of a fast food restaurant have become a thing of the past. Even unskilled employees will be able to operate the doner robot. In the twinkling of an eye, they prepare the doner in accordance with the customer’s request. Der Gerät is absolutely hygienic and ensures optimal roasting and cutting processes while working automatically. No more injuries and no more burns: Since the operator does not come into contact with the spit, the doner robot paves the way for accident-free working. Furthermore, it is ready for use around the clock. Your customers will benefit from the perfectly cut doner meat at any time. The small foot print (75 x 75 cm) makes the robot an extremely space-saving product. It therefore is perfectly suitable for narrow kitchens. The integrated sensors even allow meat-on-the-spit to be cut precisely from those spits without any optimal dimensions. In this case however, the diameter of the meat should not be more than 60 cm at a max. height of 80 cm. 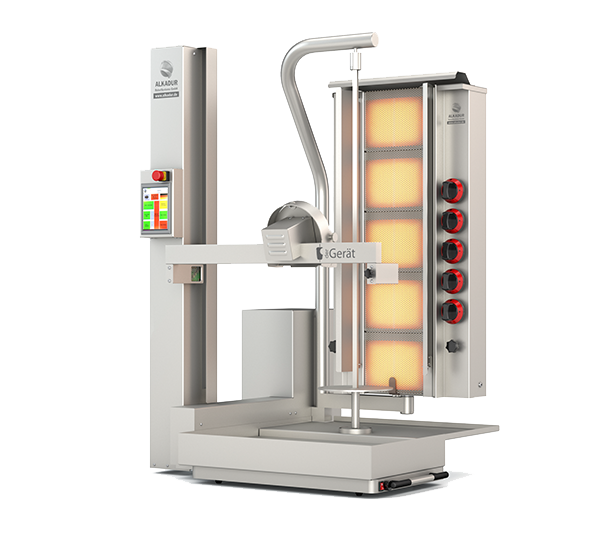 Equipped with four drive axis, the doner robot roasts and cuts meat spits with a max. weight of 100 kg. The machine weight itself is approx. 100 kg. Convince yourself of the doner robot’s innumerable advantages now! Maximize your profits and save a lot of money! Set up Der Gerät and put it into operation, immediately. The unique sensor technology of the doner robot automatically controls all workflow steps from the roasting process to the ready doner meat. Der Gerät requires just minimum amounts of current – power consumption is approx. 0.25 kWh. The purchase of a doner robot admittedly is among the greater investments. But thanks to its excellent performance, it shows quick effect and will raise your sales over the long term. This convincing investment is completed by a one-year manufacturer’s warranty and a five-year warranty period. The fully automatic doner cutting robot independently and reliably prepares doner meat in portions for sale. The simple operation while cutting makes a professional staff redundant. After a short introduction, your staff can start working immediately. Thus, personnel costs are effectively saved and training costs reduced to a minimum. With its expansion, the American fast food chain „Naf-Naf-Grill“ has proven impressively that the road to success begins with the use of efficient tools. Not only staff costs are saved but also the quality of your product is defined with the help of the fully automatic doner cutting robot. Thanks to the large variety of options the robot has been equipped with, doner meat can precisely be cut. Depending on the setting, the robot cuts the doner portions in the desired size. Predictable costs and a continually improving quality open up new horizons of expansion to you. Cut doner meat – hygienically, easily and quickly! The fully automatic doner cutting robot is able to prepare and to cut doner meat. During the process, your staff will not be exposed to direct heat so that the portions of meat can immediately be taken for further processing. This makes working comfortable and hygienical. The doner robot has been equipped with sensors perfectly controlling the cutting process. This method ensures an improved cutting performance and helps to make the most of meat portions from each doner spit. Thus, more portions are received than when cutting conventionally. Predict costs – safe quality. Sensors controlling the cutting process help to keep the cut quality of the doner robot on a consistently high level. On the one hand, this ensures the quality of your product, on the other, the doner robot thus enables you to optimally plan and control your operating procedures. Arouse curiosity with „der Gerät“. Even in the media, the brand development of „der Gerät“ created a stir. Everybody wants to see the doner robot at work. Make use of the brand advantage at your location and impress your customers with „der Gerät“. Increase success by high capacities. The fully automatic doner cutting robot has been designed for a maximum spit weight of 100 kg. The smaller version for up to 60 kg offers optimum size to even smaller snackbars so that you can benefit from a high capacity. Doner meat for your guests will always be available in sufficient quantities. This advantage pays off especially in times of peak demand. In addition, a change of the doner spit remains predictable and thus can well be organized. Prepare doner hygienically and safely. Thanks to the cutting process controlled by sensors, doner robot sets new standards in terms of hygiene and manageability. The fully automatic robot cuts the doner meat into the portions desired. Your staff can take the meat without directly getting in touch with the spit. Your advantages: Safe, quick and clean working. The doner robot has been equipped with a clearly arranged touchscreen operating like an integrated Windows PC. The different cutting programs of the doner robot are adjusted individually via the touchscreen. Operating the robot is a children’s game since the settings are clear, easy and quickly to handle by everybody. As a result, qualified personnel becomes redundant. The integrated gas barbecue guarantees correct preparation of the doner spit. Upgrading the conventional gas barbecue helps to reduce the gas consumption by 30 % – 40 %. This saves energy and thus costs. For a first visual impression, watch the video below „der Gerät“ of our web site. Individual controlling of modern cutting processes. The fully automatic doner robot is an ultra-modern machine with four drive axes. 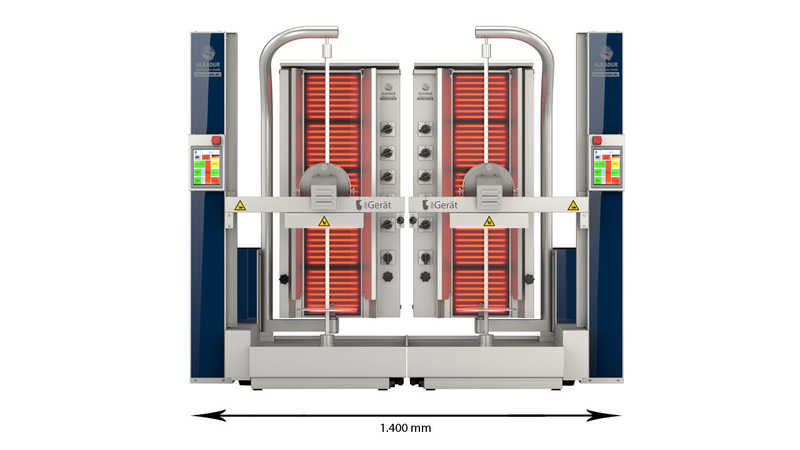 Thanks to „der Gerät“, doner meat is cut fully automatically and optimally prepared. Despite the automation however, the cutting process always remains individually controllable. ‘Der Gerät’ – international and individual. The PLC control of the doner robot provides several languages which facilitates operation by your staff. In addition, the robot can internationally be used. No matter whether cutting speed, cutting width, motor control or language menu, when individually setting the PLC control, the functions of the doner robot can be customized to suit your personal requirements.